It might come as a surprise to you, but I do spend some of my time at home cooking and baking rather than simply enjoying dishes prepared by more those more qualified. If you were in Melbourne on Mother’s Day this year, you know how miserable the weather was; cold and rainy, I didn’t want to leave the house after returning home from the 8km Mother’s Day Classic run in the morning. 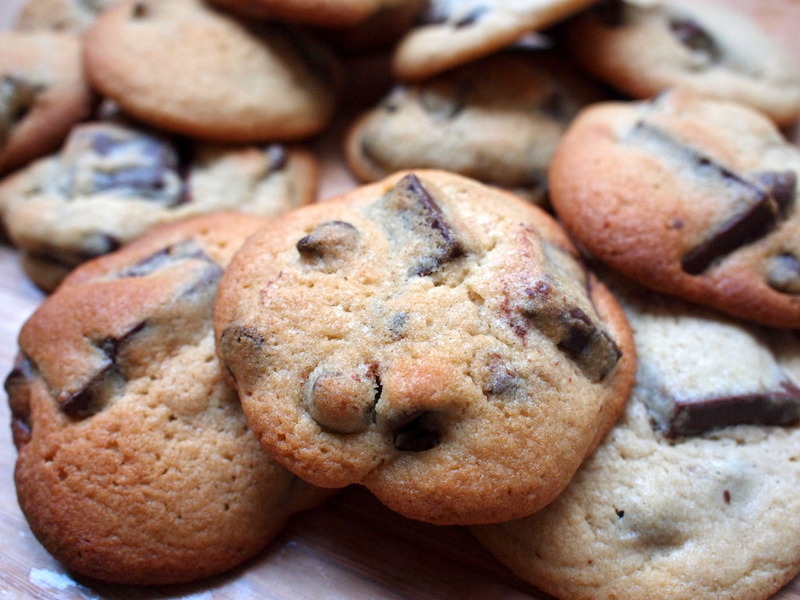 Desperately in need of something warm and comforting, I ended up whipping up a batch of Chocolate Chunk Cookies, because a simple chocolate chip recipe didn’t quite seem indulgent enough. I increased the total amount of chocolate in the recipe, using both a mixture of block chocolate and chocolate chips to get a nice balance in each cookie. I also increased the amount of vanilla and added a dash of cinnamon, mainly because I like the extra complexity in flavour. Adapted from “Marie Claire: Cooking”. Makes 20. Roll out the cookie dough onto cling-wrap and place in the freezer for an hour. 15 minutes before you remove the cookie dough, preheat an oven to 180°C and lightly flour a baking tray. Remove dough from freezer, and roll out 2 tbsp of mixture at a time onto the baking tray. Bake for 14 minutes. Return unused dough to freezer while each batch bakes. Cool on trays and eat at least one while slightly warm. My apartment smelt simply amazing while these were baking, and the extra warmth from the oven was definitely appreciated. Next time, I’ll remember to take more photos as I go along, but the final product is better than nothing. Let me know how they turn our for you if you decide to give these a whirl, or if you’ve found a way to improve the recipe. Sometimes suburbia is just that bit more attractive than the city center. It’s not so noisy, and the shopping strips and cafes aren’t overflowing with people, just busy enough to feel part of a cosy community. Kew is an area that I rarely set foot in, but I’d been meaning to try Studio Movida for quite a while and so made the journey on a nice Saturday morning. Set out the front of a privately run gym, and not in any way related to the better known Movida chain, the clientele seemed to be a mixture of those who’d just finished their workouts, and those wanting a good meal and a coffee. Roasted by Axil Coffee Roasters, their coffees were both excellent quality and well made. This was actually M’s as I tend to drink long blacks, but long blacks tend not to make very interesting photographic material. The breakfast menu is interesting with the usual suspects on offer, including toast and baked goods, muesli, and of course, protein-packed dishes. 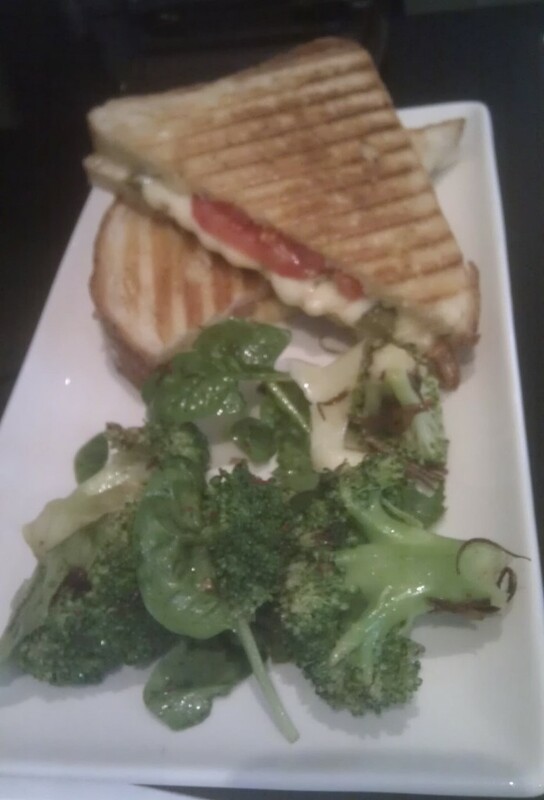 M chose the vegetarian Nom-lette. 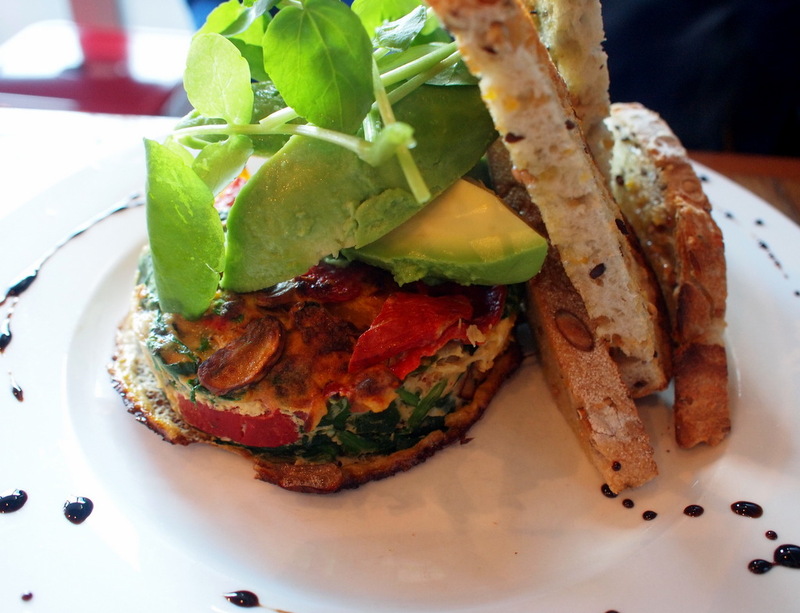 Artfully presented, it was full of vegetable goodness, with soft, creamy eggs and a generous serve of avocado. The multigrain sourdough has a good helping of seeds as well and adds even more texture and interest to the dish. I’d originally chosen the eggs with salmon, but the chef asked if she could make something new that she’d been working on for the menu. How could I resist that offer? 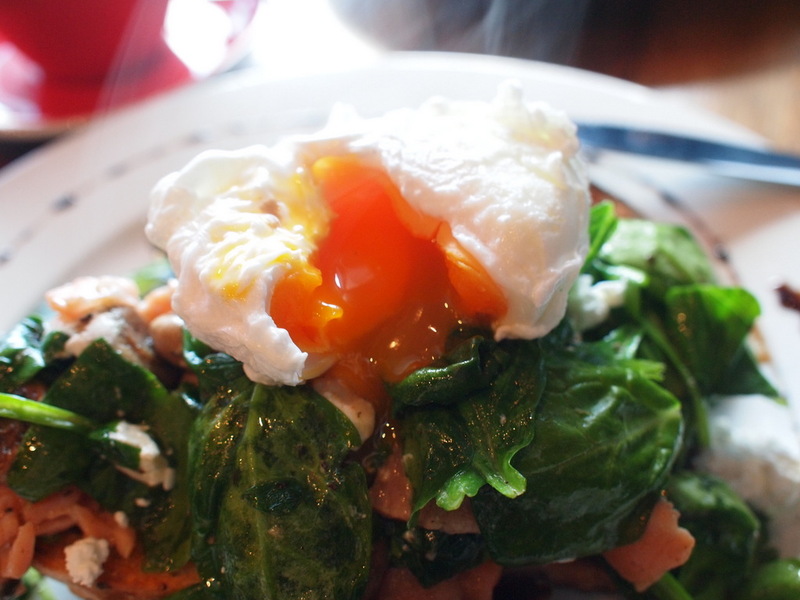 Smoked salmon, mushrooms and fetta on a bed of spinach, topped by a single, perfectly poached egg with the sourdough multigrain to serve. Amazing. The saltiness of the salmon and fetta were just-right, and the entire dish felt nourishing, yet a touch special at the same time. I was impressed, and am hoping it becomes a fixture on the menu. Any ideas for the name though? Preferably a pun involved. 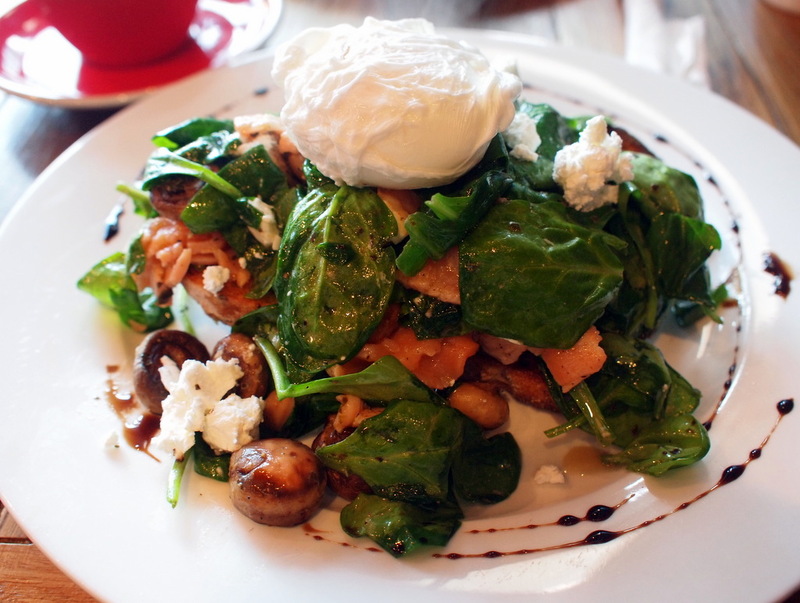 Studio Movida serves typical brunch fare but at an excellent standard. 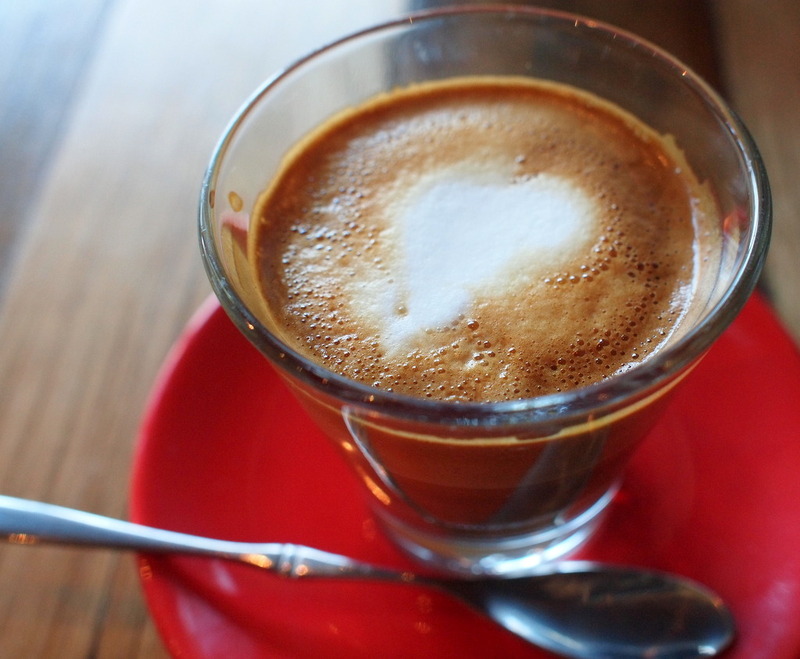 Good coffee, music and service seal the deal, and the option of a nearby gym just adds to the appeal (but only if you live in the area). My advice? Check it out before it becomes too popular, which I have no doubt it will. 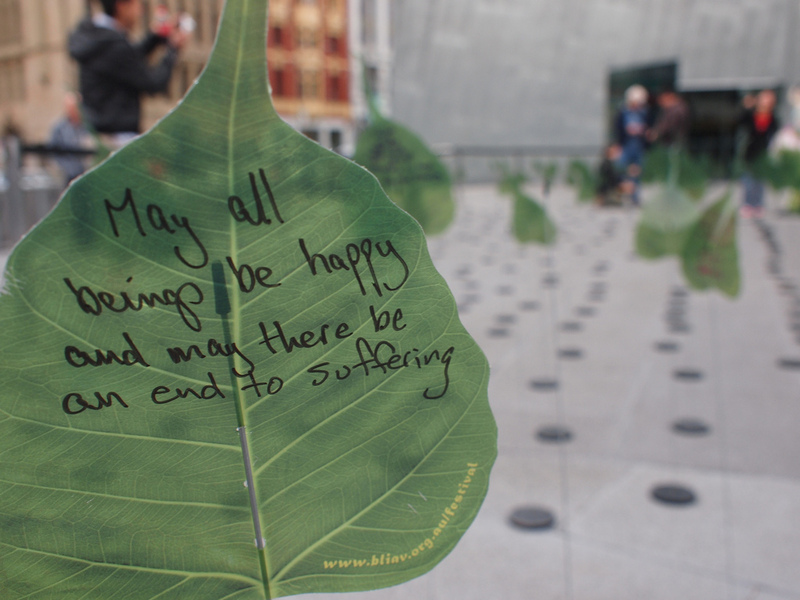 A circumstance would have it, when the craving for a lazy Sunday brunch set in, I was lucky enough to be in the city. 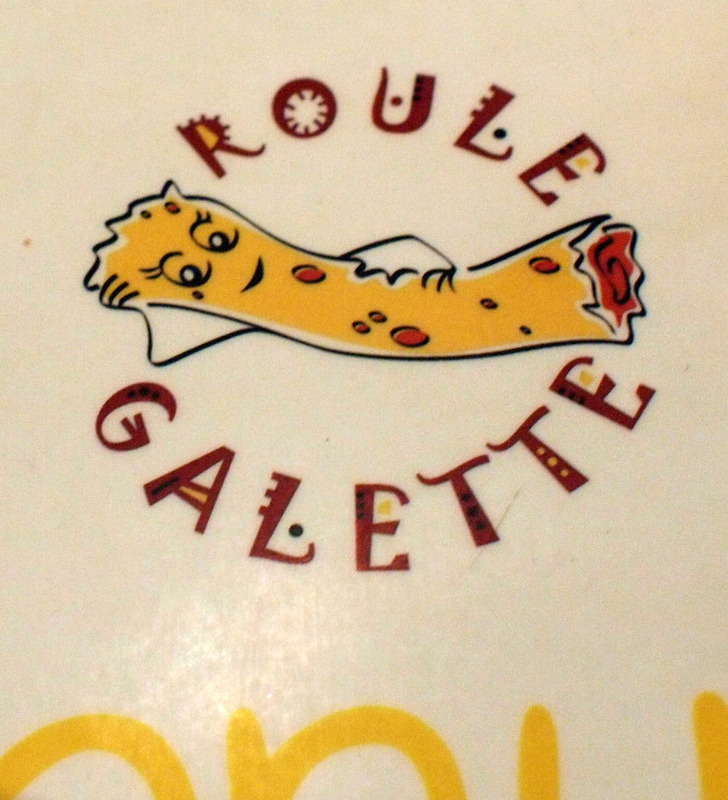 I wasn’t about the pass up on an opportunity to indulge myself silly, so a decision was made (by me) to head to Roule Galette and feast on galettes and crepes. I’d walked past this establishment many times, yet never ventured in, even though the dulcet tones of the french singers over the sound system in this small little cafe called to me. I couldn’t help but notice the interesting artwork, obviously produced by someone affiliated with the cafe, and whoever designed their logo certainly had a sense of humour. Who could resist a seductively posed cartoon crepe/galette after all. 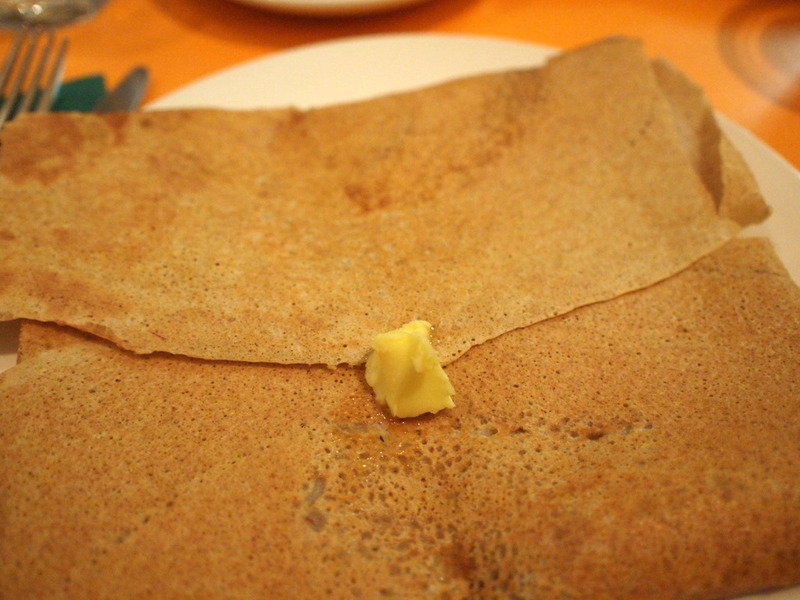 Indeed, the same could be asked of the extensive range of galettes (thin buckwheat savoury pancakes) and crepes they make to order. After drinking our surprisingly good coffees (they didn’t advertise who their suppliers were), we hungrily dug into our galettes. 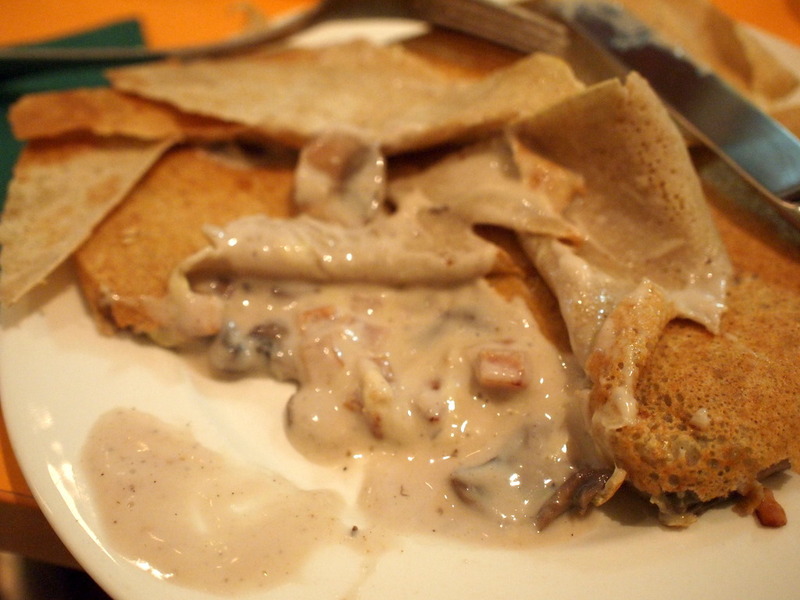 I’d ordered the Forestière, filled with béchamel (French white sauce) with bacon, mushroom and cheese. …the galette was gloriously revealed in its entirety. Amazing! So creamy and rich, without being too salty, the bacon added a nice texture while the galette held the whole dish together. Satisfying, I was definitely happy with this dish. 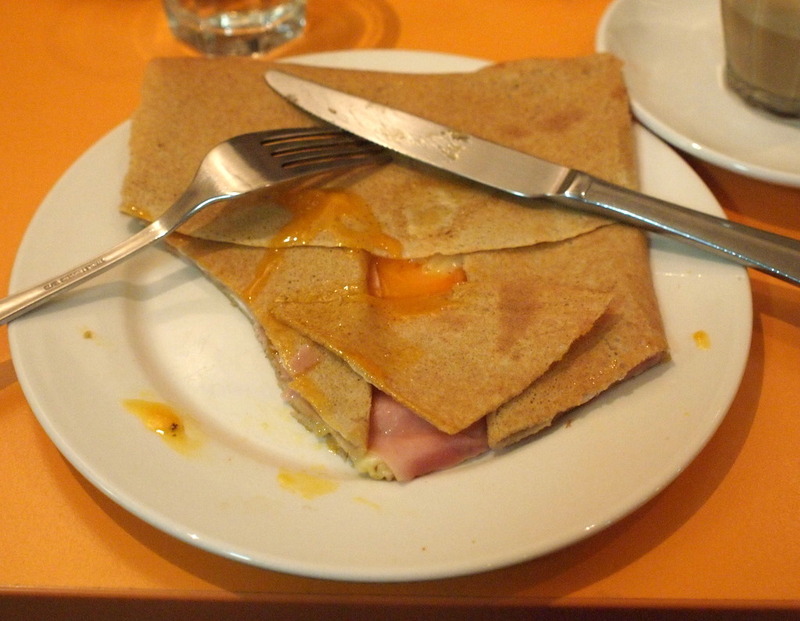 M chose the somewhat more ‘breakfast-like’ Complète with an egg, ham, shredded cheese and butter. I found it less interesting than mine, but it was good nevertheless. I’d mentioned before that I fully intended to indulge myself silly, so we each ordered a sweet crepe in addition to the galettes. Rich and decadent, I’m not sure you could ever go wrong with this combination. 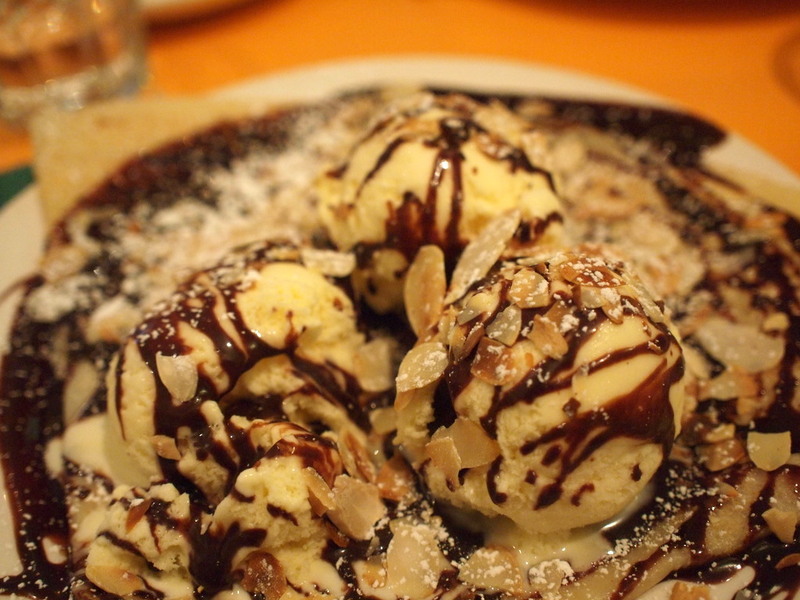 The crepe was thin, yet perfectly suited to soaking up the dripping ice-cream. 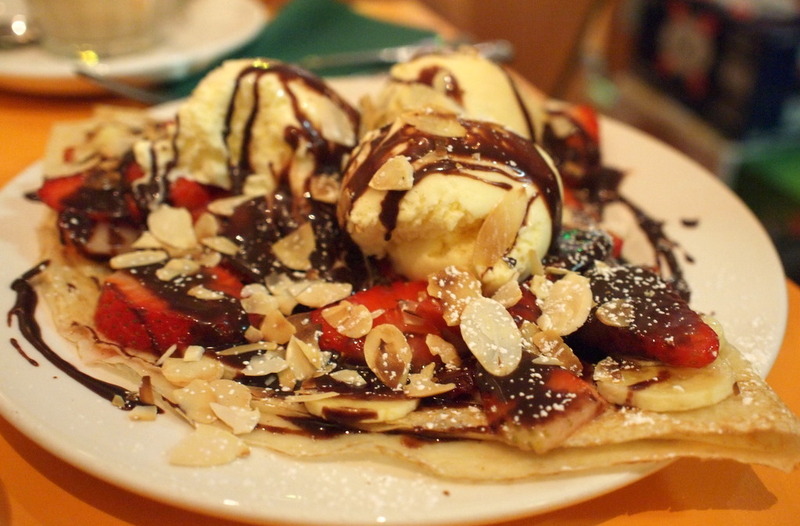 M decided to one-up me, and ordered the Gourmande with ice cream, fresh banana, chocolate, strawberry and flaked almonds. This massive dessert was definitely something to behold. Somehow he finished his crepe before I did, but maybe that’s testament to how good it was. Both of us left Roule Galette feeling very satisfied and cheery, with bellies filled with good food that cost surprisingly little. 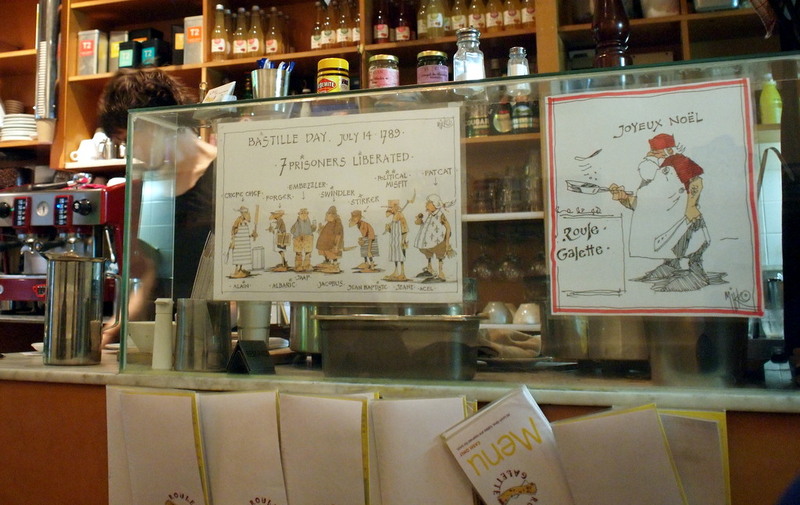 Fast service and good food at a reasonable price definitely make this a great cafe to indulge in a delicious crepes, galettes and coffee, and for imagining that you’re in a tiny, cosy cafe in Bretagne, France perhaps. 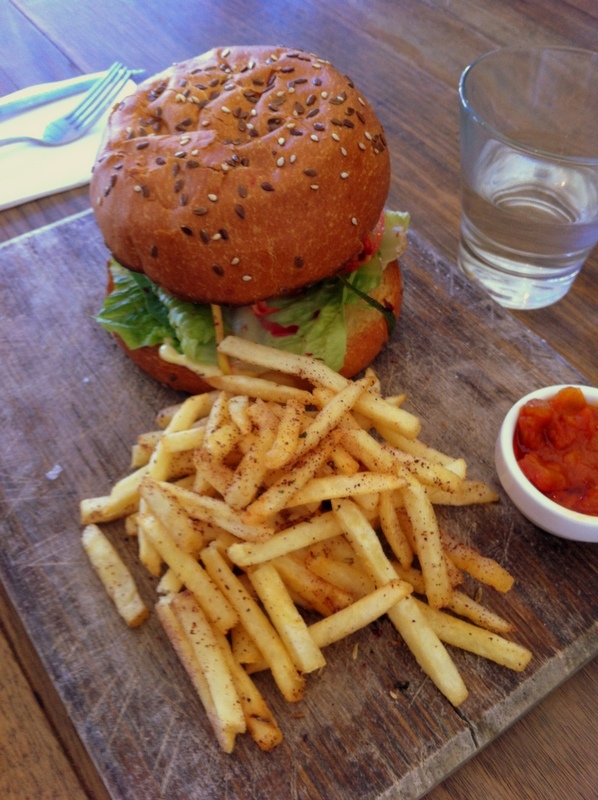 After a tip-off from a fellow blogger, Catty, I decided to head to Sparrow’s Nest for a lunch catch-up. It was a miserable, rainy Melbourne day that felt decidedly like Winter (even though it’s still only Autumn) so I wasn’t tempted to straw far from work. As we’d gotten there quite early (1210), we managed to snare one of the brightly lit window tables in this cosy little cafe. 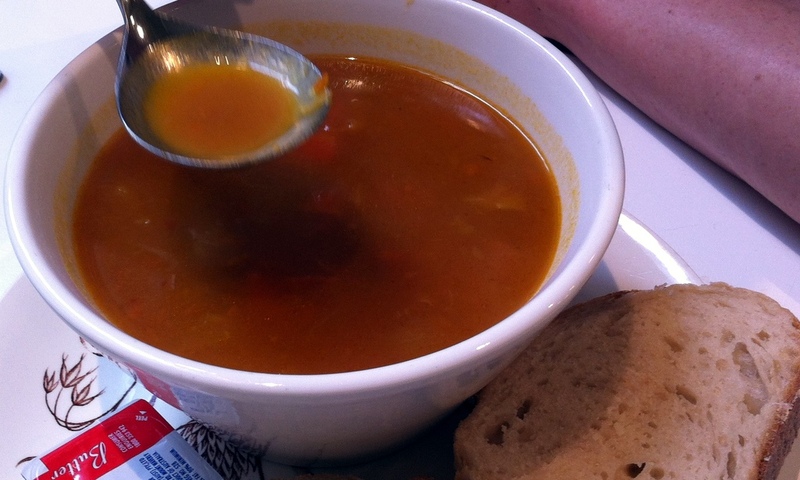 It didn’t take us long to select our meals from the array of focaccias, salads, pies and soup. Cold days leave me with carbohydrate cravings (must be a store-energy-for-the-winter-months thing), so I decided to go with the Roasted Vegetable and Goat’s Cheese Focaccia. Honestly though, it was the Goat’s Cheese that got me – I can’t go past the stuff and indeed, was very disappointed that Merideth Dairy was closed last time I was down on the Mornington Peninsula. I’m drifting though. The focaccia itself was brilliantly satisfying in terms of both quality and quantity. 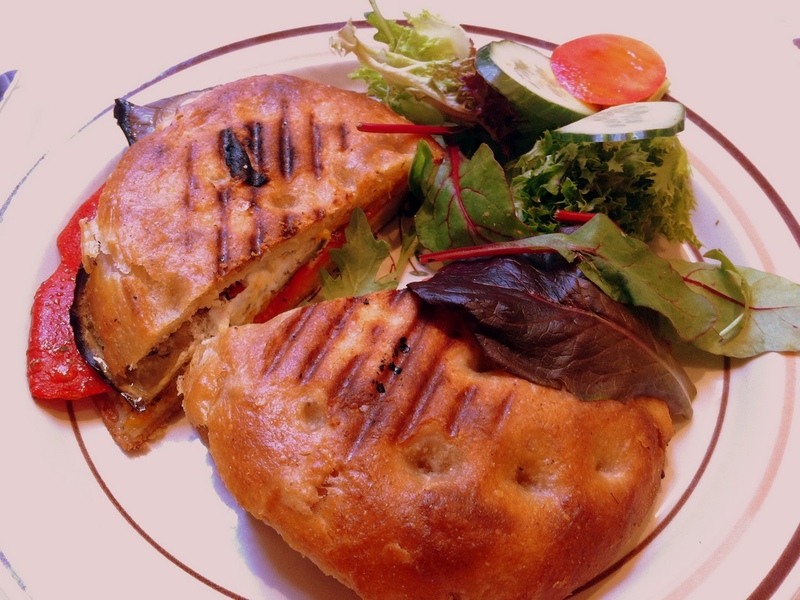 With soft white bread was generously smeared with the slightly salty goat’s cheese, then filled to the brim with perfectly roasted eggplant, capsicum and pumpkin. The accompanying salad was uninspiring, but frankly I didn’t care. The focaccia itself would have been enough. The soup was delicious and nourishing, and the accompanying sourdough by Dench Bakers was very good (and he’d just gotten back from a year in Japan, so it must have been mind-blowing for him), but unfortunately it took a good 30 minutes for the pie to arrive. It hadn’t been heated properly so they had to return it to the oven. The staff were apologetic and surprisingly, didn’t charge us for it (although my friend did leave an $8 tip because it wasn’t all that much of an inconvenience). Alas, I didn’t manage to take a photo of it when it did arrive as he ravenously ate all of it. Must have been good in that case! 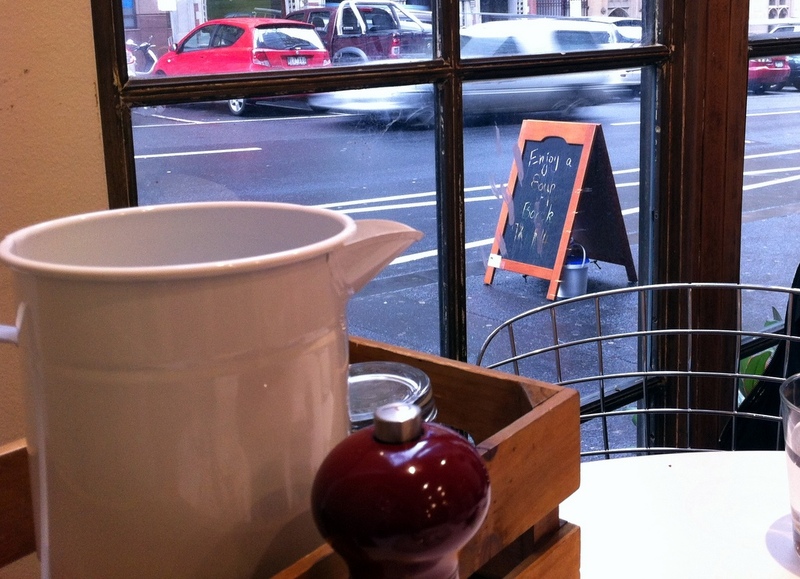 Sparrow’s Nest is a nice little cafe that has a steady stream of customers for both coffee and food. It serves good, simple, food and has great service, and is definitely somewhere I’d return to, especially for my next focaccia fix. It’s been a while since I’ve caught up with any of my university friends, so I organised to have brunch one delightfully sunny Sunday at Coin Laundry (nothing like the cold, rainy weather we’ve had this week). We’d heard good things about the cafe, so were keen to try it out. It was, well, normal. I don’t necessarily mean that in a bad sense, it was just rather underwhelming considering I’d heard great things about the coffee here and so my expectation were likely to have been too high. Perhaps they were talking about great lattes, but at least the long black was drinkable. It just didn’t stir up any great emotion in me. We’d actually been seated late enough (after 12 pm) that the lunch menu was available to us in addition to the breakfast menu (the magic of brunch). 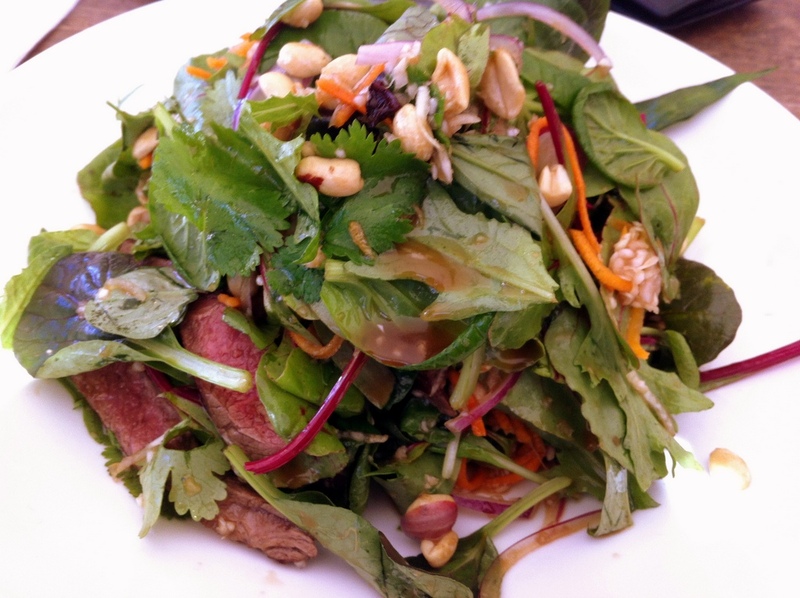 After carefully considering the options, I chose the light Thai beef salad with roast peanuts, pickled vegetables & Asian herbs. Or at least I thought it was light. There was too much beef for my liking, and it was rather tough. The dressing was well-balanced however, so it wasn’t hard to keep eating it. Something easier to eat might have made me happier though, so perhaps I should have just stuck with the breakfast menu. It was a large burger. My friend got about halfway through the burger before giving up on the meat pattie altogether, and just eating the salad and the bun. I don’t blame her in all honestly, that much mince meat can’t be good for you. The fries weren’t anything special, but we weren’t really expecting them to be. So was it all worth the drive and the wait? No. It’s location is simply too out of my way for me to bother again, and if I want to wait for brunch, there are certainly places with better food to wait for. Sorry Coin Laundry, you just didn’t live up to my expectations. It’s been quite a while since my last update, and indeed, since I’ve been out. My mother was down in Melbourne for the night, so it was a good an excuse as any to try a new spot for dinner. At a loss for where to eat (she didn’t make it any easier when I asked her what she felt like by saying ‘anything’), we ended up at San Paolo Solarino, a pasta and wine bar just off Little Collins St. It was relatively quiet when we got there around 630, but quickly started filling up after we had ordered our meals. The trickle of customers resulted in a very mixed crowd; there were those who’d obviously just finished work, a few cosy couples, and even some single diners perfectly content with their books, iPads, smart-phones etc. While the antipasto platter looking appetizing, neither of us were particularly hungry so ordered two mains to share between us. Trust me to go to a pasta and wine bar and not order either, being a fan of wine, but certainly not of pasta. We were perfectly happy with the menu despite this limitation. It was amusing listening to mother attempting to pronounce “Risotto”, but I spared her the pain and ended up ordering the Risotto with pancetta, quince, rosemary butter and quince vincotto. Does the vincotto count as trying the wine then? 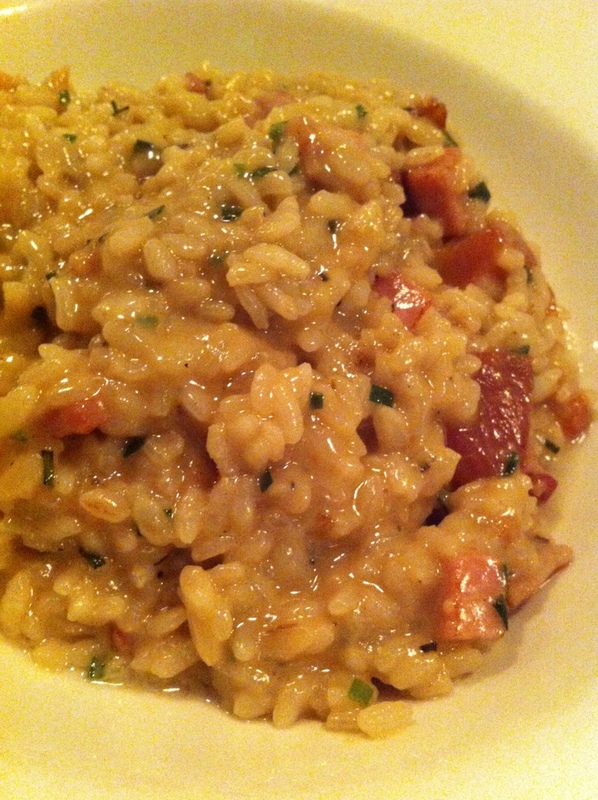 Probably not, but in any case, the risotto was quite good, but more than a touch on the salty side. The rice was well cooked and the dish was creamy, strong and filling. I was glad we’d ordered a salad to offset the richness however. 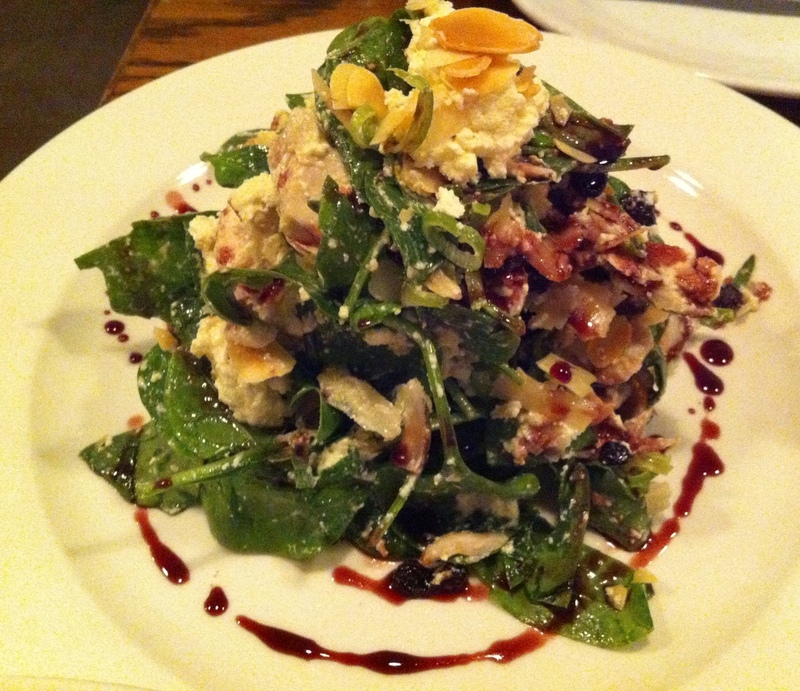 The must try according to The Very Very Hungry Caterpillar was the Chicken salad with ricotta, currants, almonds and spinach and boy was it a good recommendation. The chicken was tender and well-flavoured and I always love nuts in my salads as they add that bit of crunch and substance to a dish that is inherently light and I’ll never say no to cheese, although I would have liked fetta instead of ricotta (personal preference). The currants were a great sweet counterpoint, and somewhat required after the saltiness of the risotto. Wine from the predominately Australian wine list would have matched well to the dinner, but for us, it was more of a hindsight rather than a requirement. I probably won’t return (well, maybe for the salad) due to pasta usually lying low on my cravings meter, but it’s still a nice cozy place for a weeknight dinner. Having finally found a reason to visit this much-lauded Melbourne restaurant, little did I anticipate that it would be a month and a half before I finally got around to writing this review. Better late than never though right? We headed in early on a Tuesday night and were a little surprised at how busy it already was. Catering to a relatively mature crowd, the restaurant was noisy but not overtly so. We were promptly seated at a table that looked a little too small for a tapas style menu (or perhaps that added to the vibe, but in any case lots of plate-juggling would occur for the rest of the night) and settled in for a night of good food and wine starting with a a glass of celebratory champagne. Pictures and remembering dishes was somewhat secondary to celebrating the occasion, so you’ll have to excuse me. MoVida offers a mix of Tapa (small individual pieces at $3.50-$5.50 each) and Racion (plates to share at $7 for olives to $50 for aged ham). We were enthusiastic about trying every dish and felt somewhat like kids in a candy store when presented with the menu, but our stomachs probably couldn’t have stretched quite that far, and so restraint was required. Nonetheless, we still ordered a respectable number of dishes between us. Ordering in English seemed like the safest bet though because A. the waiters were obviously Australia and B. even if they were Spanish, my toddler-level Spanish would probably have offended them. First up, the ubiquitous dish of croqueta(s). 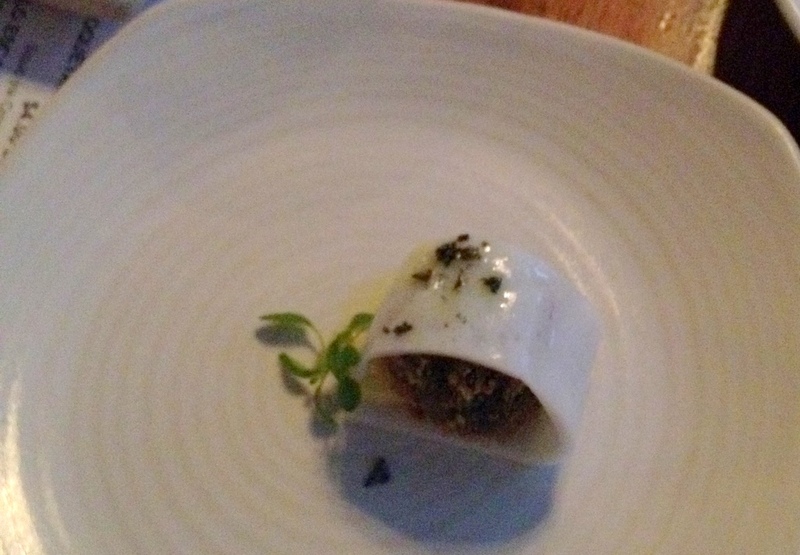 The squid ink croqueta was contained within a cuttlefish skin that was reminiscent of a sushi roll. Slightly chewy, the bite-sized morsel was packed full of flavour and texture. Definitely one of the better renditions of the dish I’ve had. I have a weakness for goat cheese, so the Queso Manchego was a must order. 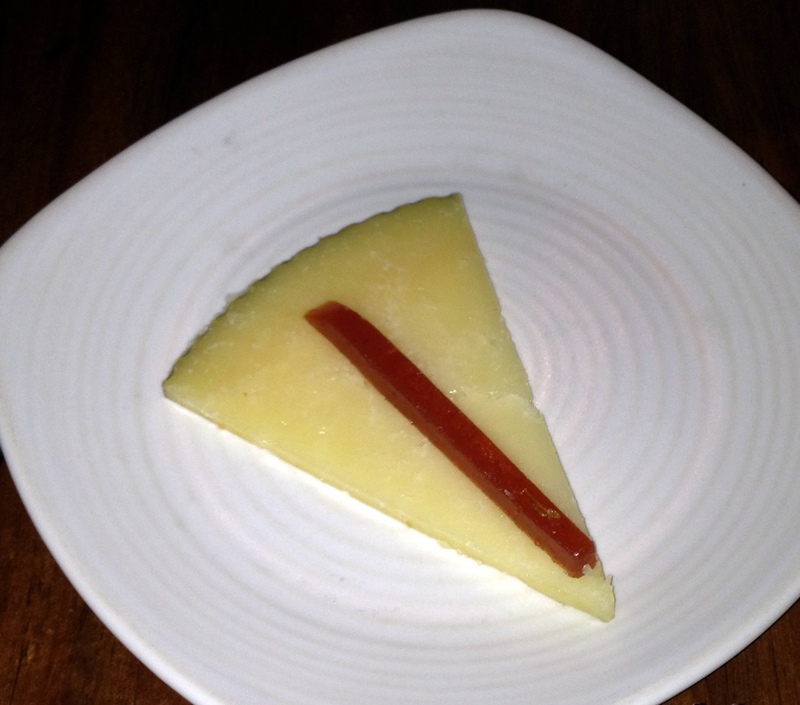 The cheese was delicate, and the quince paste was a nice counterpoint. I just wish there was more of the quince paste. The tiny sliver was barely enough for a bite of cheese, and without the accompaniment, the cheese got boring quite quickly. 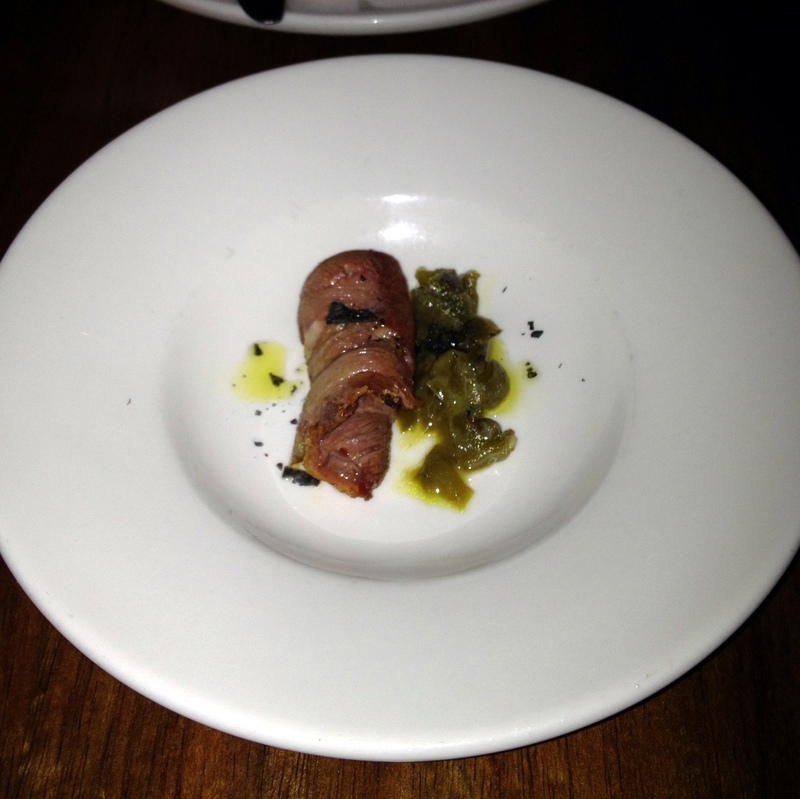 Luckily, up next, we had the lovely Cordornice – pressed quail and morcilla with apple and pickled garlic. 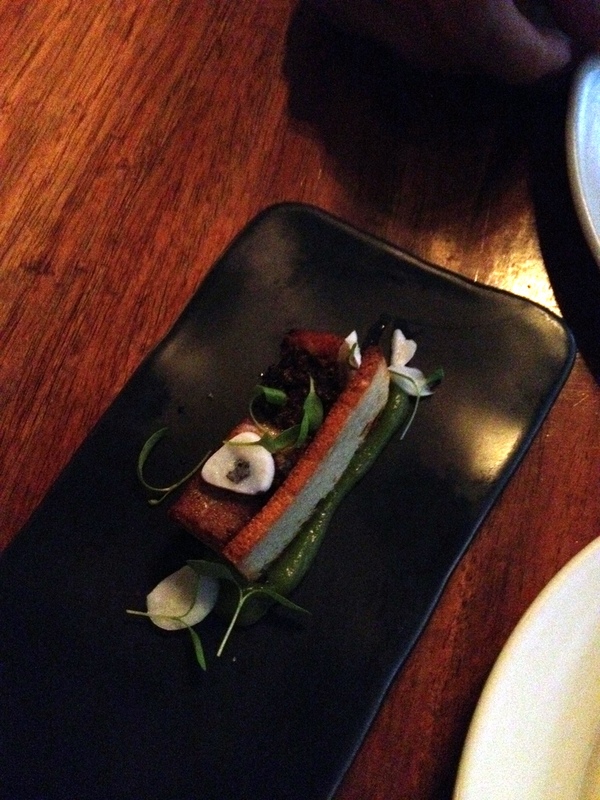 Beautifully presented, it didn’t look much like quail, but it certainly tasted like it. Quail is the more interesting version of chicken, but I always find it doesn’t have the same ‘comfort’ factor. Not that comfort is a requirement of a dish such as this, but my thoughts follow an odd path sometimes. Also interesting was the morcilla, otherwise known Spanish Blood Sausage, so while this dish didn’t blow me away, at least it kept my interest levels up. One of the must order items on the menu was the Lengua – char-grilled veal tongue with green pepper sofrito. I must say I found the presentation of this dish lacking, but it was certainly delicious. 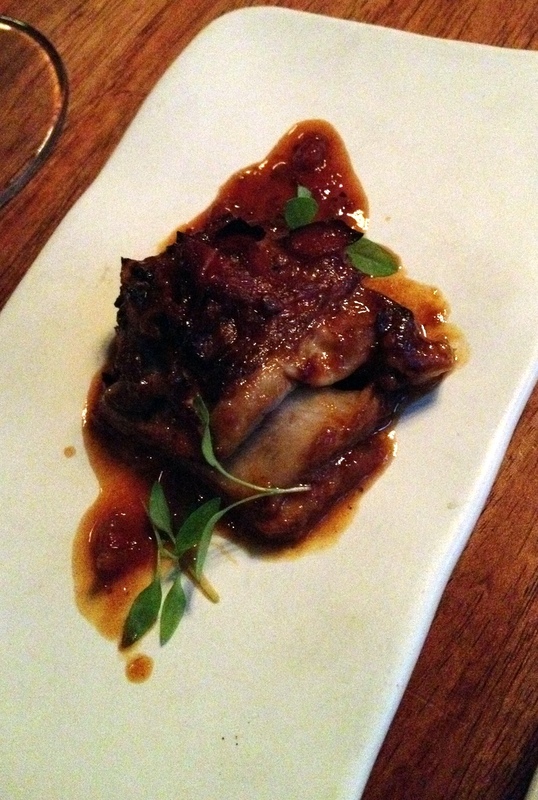 The veal tongue was tender and the sofrito was packed full of flavour without being too oily. Why couldn’t there have been more of it! I wouldn’t have minded eating an entire dish (well, maybe entree sized) of just this. The last two tapas dishes were greatly contrasted, we ordered the Cordero al Chilindron (Pyrenees wet roast lamb breast with fino and paprika sauce) and the Caballa Ahumado (house cold smoked Spanish mackerel with pine nut gazpacho sorbet). I have no idea what a ‘wet roast’ means, but it worked for this dish. Lamb has a tendency to dry out when you roast it, but this was moist and easily cut with a fork. The fino (a variety of dry sherry) sauce added an extra hit of flavour. We were wondering what the smoke smell that wafted by every few minutes in the restaurant was, but it wasn’t until the smoked mackerel dish arrived at our table did we realise that this was the source of the intriguing aroma. Lightly smoked, the purity of the fish really shone through. 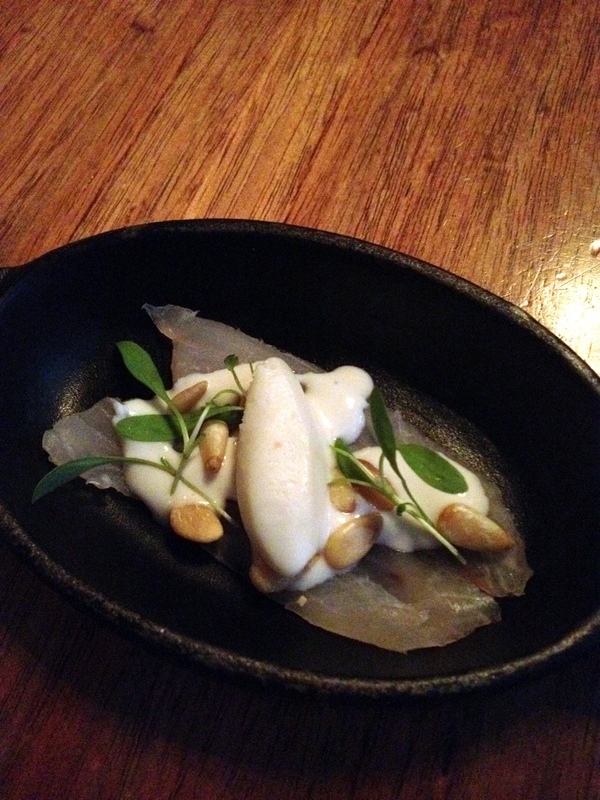 Well presented, the pine nuts lent a nice ‘crunch’ factor to this dish. After finishing the tapas dishes, with a lot of the aforementioned plate juggling, we moved on to the larger racions. I can get a little obsessive with my greens, so of course we ordered a salad. 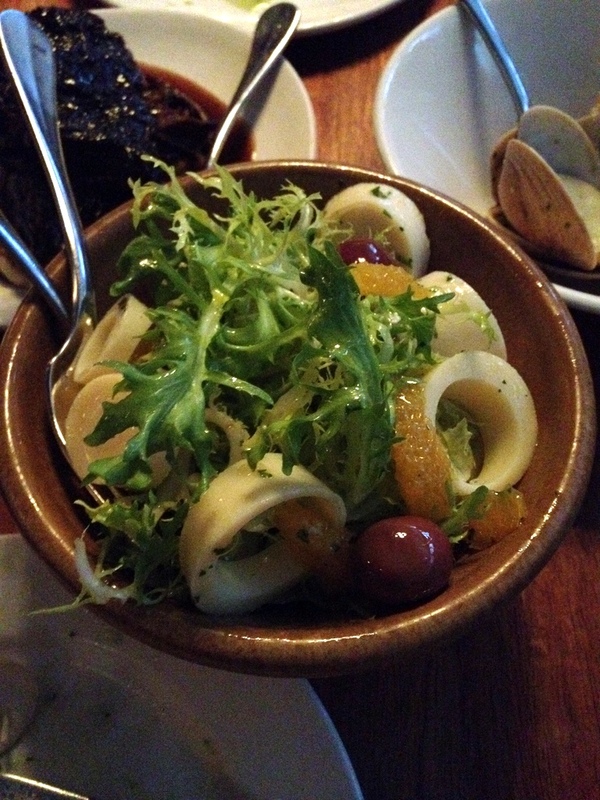 The Valencian salad with endive, orange, palm hearts and manzanillo olives was interesting enough to be counted as a dish on its own, rather than a side dish. 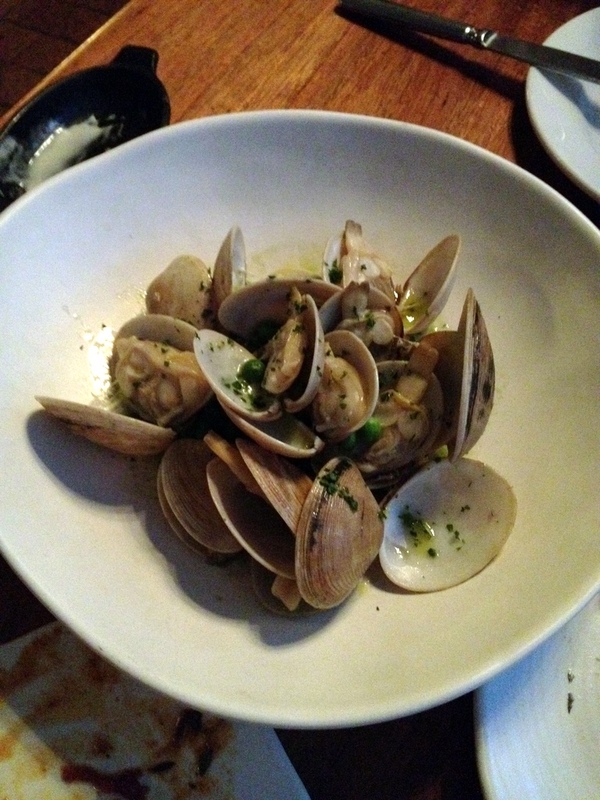 The special of clams with a pea sauce captured our attention, and we couldn’t go past ordering this dish. While I’m sure there was a fancier name for this, I can’t for the life of me remember what it was (the trouble with ordering specials!). While the clams were succulent and juicy, they weren’t didn’t quite match my expectations. Perhaps that bar was set too high for seafood? 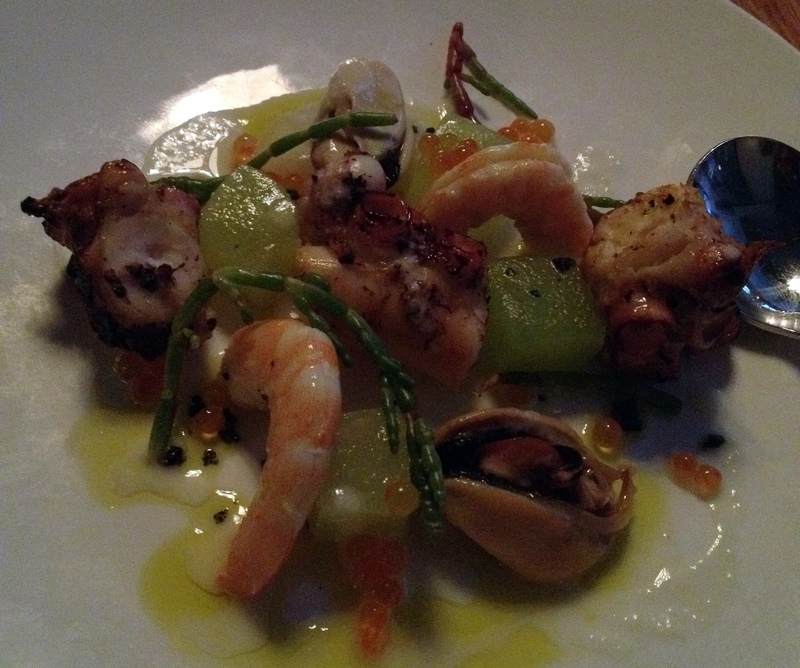 Indeed, the Salpicon dish (a seafood salad of octopus, prawn, scallop and mussels) didn’t impress me either. Our last main was very impressive though. 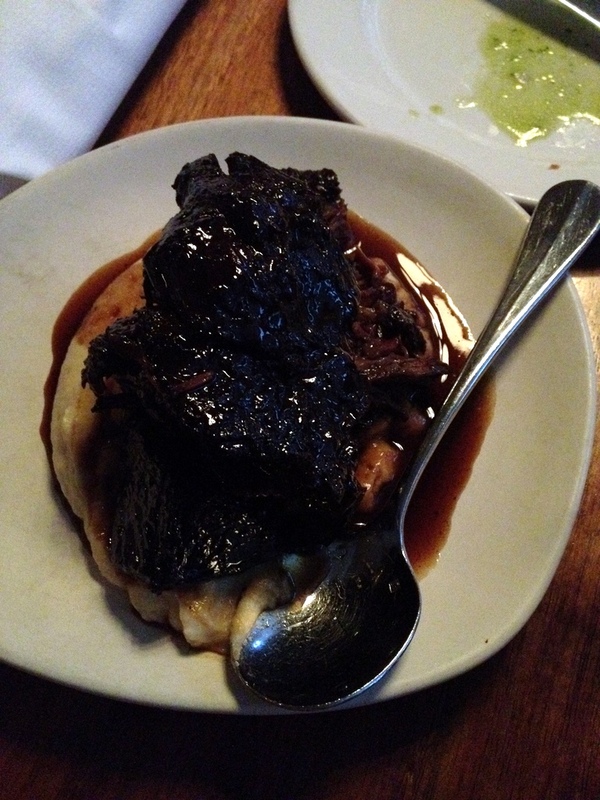 The Carriellera de Buey consisted of slowly braised beef cheek in Pedro Ximenez on Cauliflower Puree. I have to figure out how they made this cauliflower puree (probably with lots of butter) because it was some of the most addictive I’ve ever had. Oh, and the beef wasn’t bad either (though this line suggest that I’ve missed the point of this dish). I’d previously thought only red wines worked well in beef dishes, but I was happy to be proven wrong on this occasion. 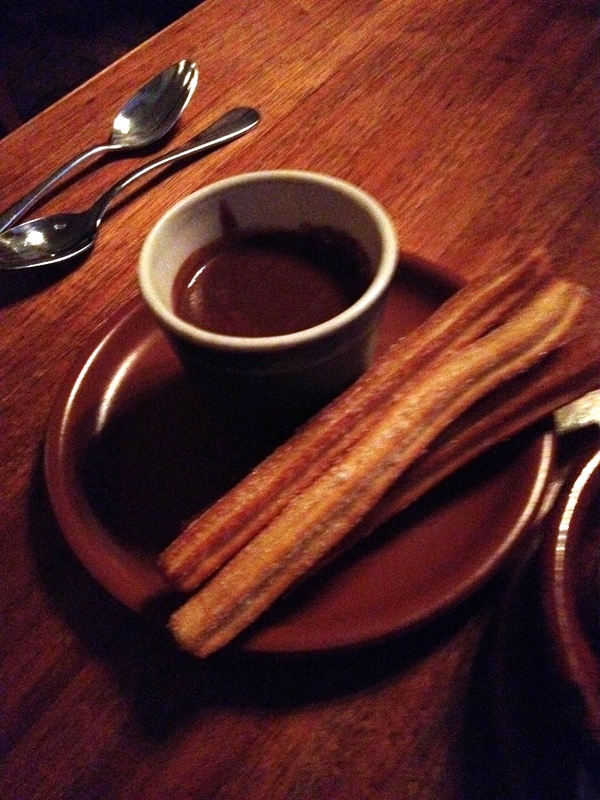 We couldn’t wait for dessert though seeing as my companion had never had churros before. Ever. Unbelievable. So these weren’t the best churros you can get as somewhat surprisingly, San Churros is better than a top-class Spanish restaurant, but they were a good introduction. The other dessert was much more impressive. Alas the curse of the specials hits again. 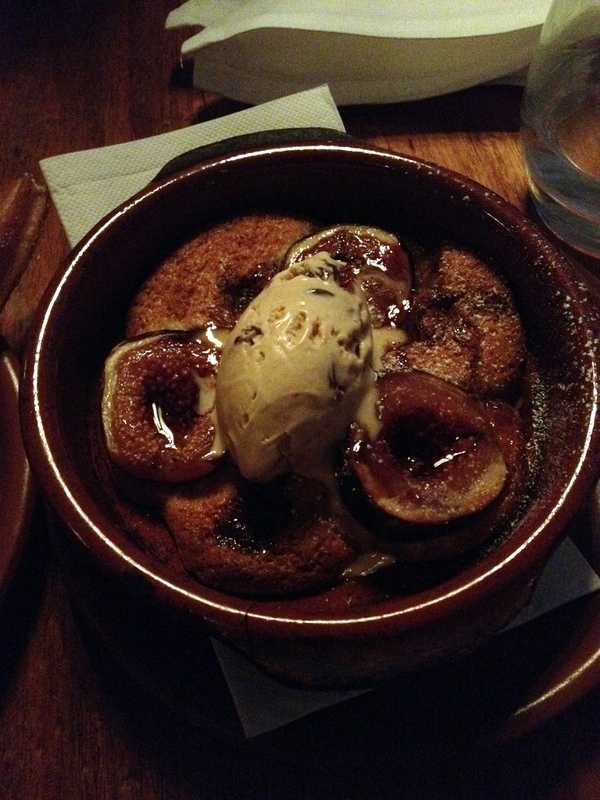 I’m fairly sure this was a poached fig cake/pudding with vanilla ice-cream. Almost nudging the side of ‘too-sweet’, it was warm and decadent and the perfect way to end the evening. You can’t lose with the combination of pudding and ice-cream. Don’t even try to argue that with me. Somehow during the course of the night, we also finished a glorious bottle of red. At the recommendation of the sommelier, we went with the 2008 Palacios Remondo ‘Propiedad’, a mix of Garnacha, Tempranillo and Graciano. I loved it for the rich berry and vanilla flavours, but M didn’t quite like how hard-hitting it was. Surprisingly, it matched most of the food quite well. 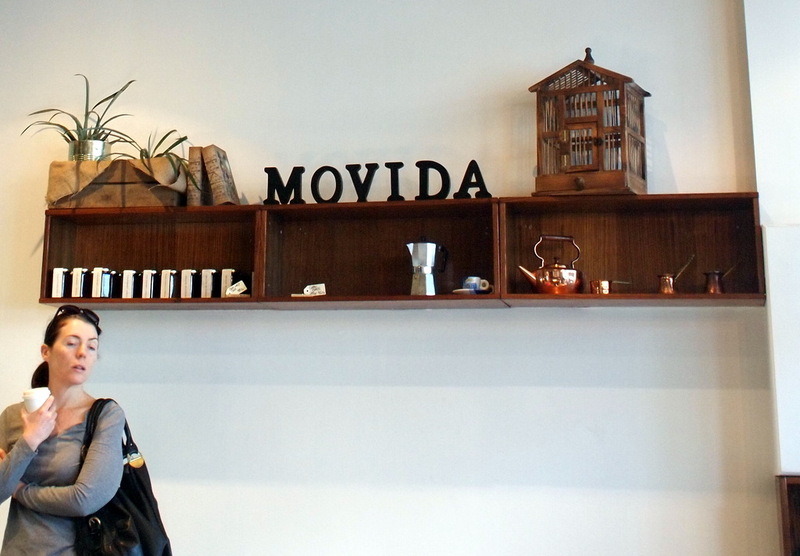 Overall, MoVida serves delicious but simple fare (for a top-class restaurant), good service, and a lively atmosphere in wonderful company made it a great night. While I can’t pick a particular highlight, neither can I pick a particular disappointment. Do yourself a favour and book here when you’re in the mood for great dining, minus pretentiousness. 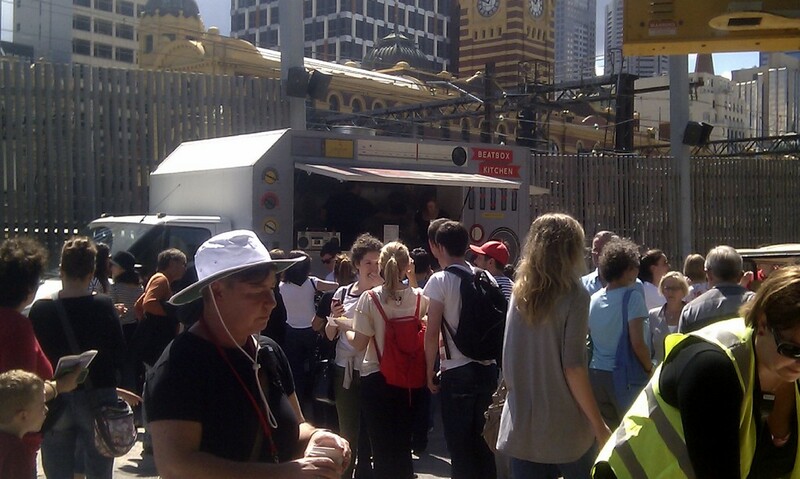 Food trucks. I can understand the appeal of them from an ‘it’s an adventure’ level, but subjecting myself to the tortures of tracking one of these down, then shelling out quite a considerable amount of money on food without much service doesn’t hold all that much appeal for me. 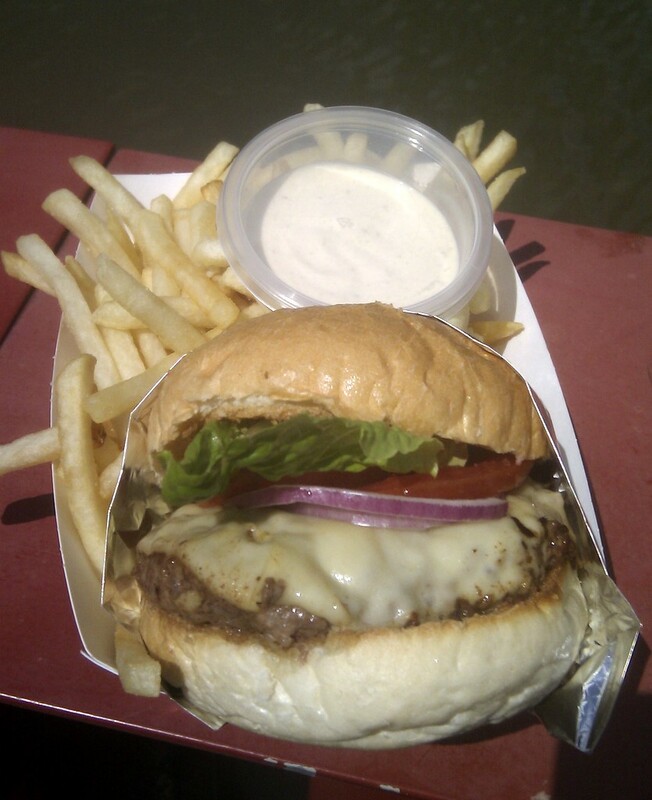 After waiting 10 minutes in the blistering sun, we finally obtained our burgers and ravenously dug into them. The Shroom Burger ($10) was the best vegetarian burger I’ve ever had. 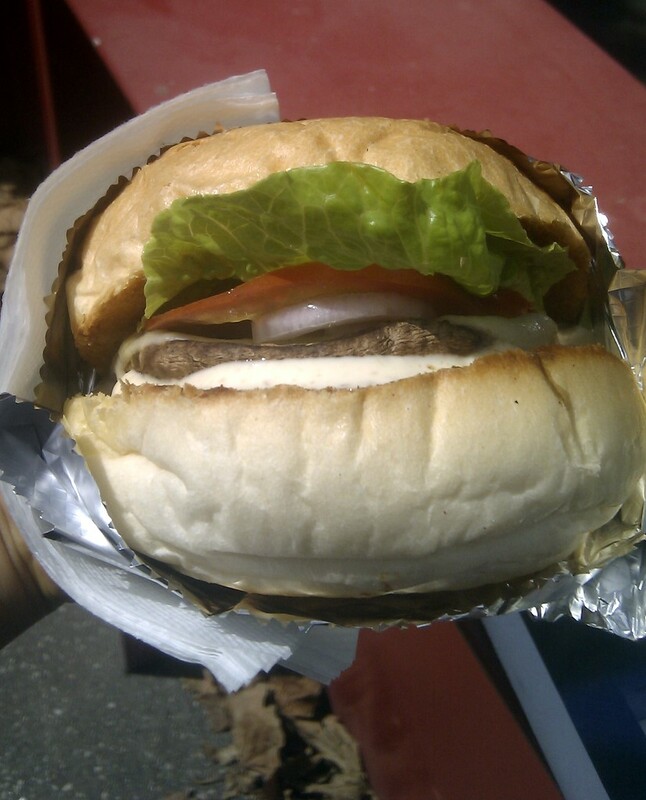 The bun was amazingly light and fluffy, with a juicy Portobello mushroom and a generous serve of lettuce, cheese, tomato and onion. You know what made the burger extra special though? The stereo sauce. Don’t ask me what the stereo sauce is exactly (trade secret I imagine), but my-oh-my was it tasty. Sweet and slightly tangy, with just the right amount of creaminess, it makes the Big Mac sauce look (more) pitiful than ever. It was for a long-overdue catch-up with two friends that I made the trip from work down to Threefold for lunch. Other than being aptly named (because there were three of us, get-it? ), it was relatively close to all of us and had fairly good reviews over the web. I did forget my camera though, so you’ll have to put up with my terrible phone camera pictures. This is probably happening more often than I would like, so I need to step up my game! The chicken was too salty for my tastes, but was tender nevertheless. 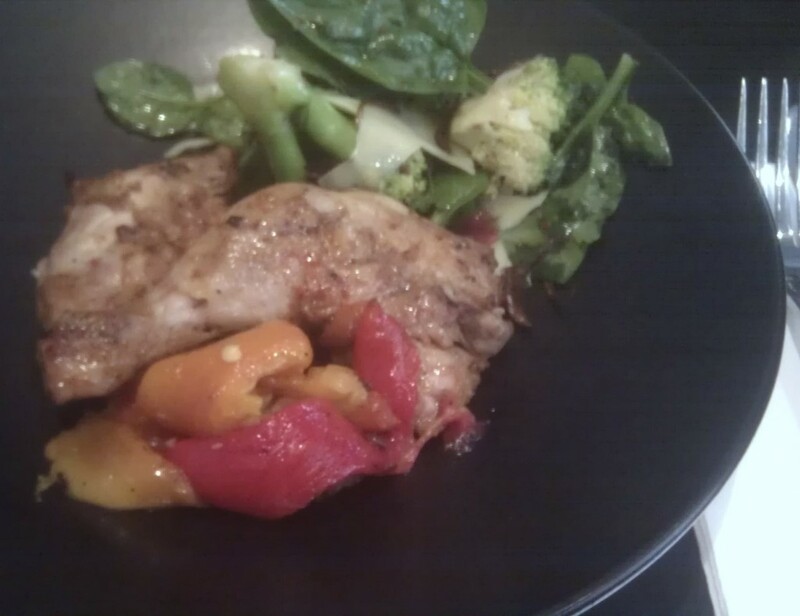 I’m a sucker for grilled capsicum and wish that they’d actually added extra to the salad itself, if only to make it a bit more colourful. My other companion ordered two salads. 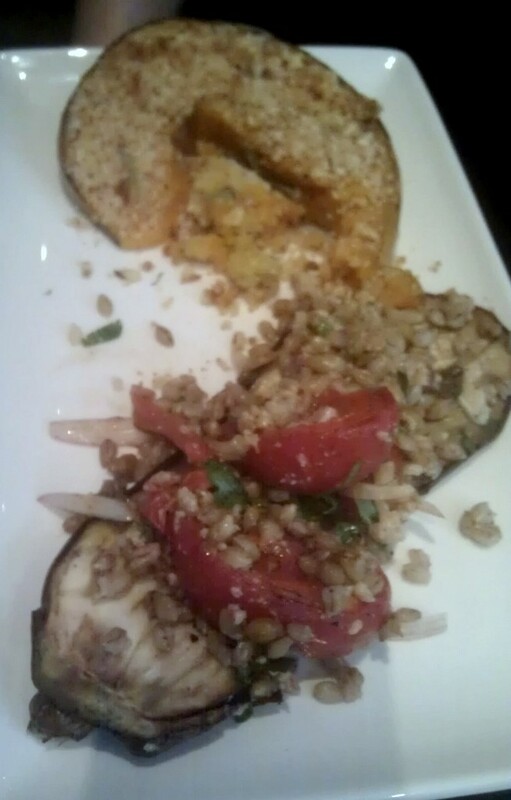 My first reaction was, “What?” but any thoughts I had about insufficiency were dismissed when the meal arrived. When they say ‘Pumpkin Wedges’ I was imagining smaller pieces, but a wedge is a wedge, even if it’s a gigantic piece. I’m not sure it quite constitutes a salad, but we live in a world where these things can be freely interpreted. It did look quite tasty and the thought of ordering a take-away salad crossed my mind. The food was decent here, though the serving sizes were small for the price paid. The coffee and service are both good though, so if you’re after a quick, relatively healthy lunch, it’s worth giving this place a shot. Other places do these dishes better, but there’s certainly something for everyone here (though maybe not enough space).